Here in Nova Scotia, where the Annapolis Valley produces some of the world’s finest apples, you’d think well crafted artisanal ciders would abound. That wasn’t the case for a long time (I well remember when Strongbow was as good as you were going to do) but as the craft-beer scene has taken off, so has local craft cider. Bulwark isn’t Nova Scotia’s first craft cider, but it’s my favourite. From the cidery: Our signature cider, Bulwark Original, is a handcrafted traditional cider, which is dry, crisp, and refreshing. It has a faint hint of spice followed by the Bulwark Original signature flavour that is achieved through our careful blending of five varieties of freshly pressed Nova Scotia apples grown in the famed Annapolis Valley. The dry start is quite complex without the intense sharpness often associated with many traditional dry ciders. It moves quickly from dry to an almost wine-like and slightly mineral fruitiness before relaxing into a nutty floral finish. Great on its own or on ice! Appearance: Golden straw colour, with bubbles and carbonation that would make champagne jealous. Ciders generally aren’t much to look at, but lively carbonation coupled with the (read on) robust nose promised something special here. Aroma: Apples. Just plain, wholesome, delicious apples. Take a nice crisp granny smith, cut it up and inhale—that’s it. None of the artificial sticky sweetness that bedevils the aroma of lesser ciders. Taste: Good craft beers can be subtle and layered, with flavour profiles that sneak up on you, and go in unexpected directions. Good cider isn’t like that. A good cider is as crisp and straightforward as a punch in the face. This is a very good cider. Take a bite of a really crisp little green apple. That’s what Bulwark is like. There’s a very brief hit of sweetness, followed by a smooth, crisp finish, that’s not quite as dry as you might expect. Some online reviewers describe a spiciness here, but I had two bottles and didn’t get a bit of that—just perfect, delicious apples. It’s also available on tap, so that might account for the difference. Overall: This is the cider I’ve been seeking for years. It’s beautifully balanced, tart but not too tart, and amazingly refreshing. It pairs wonderfully with a fiery Thai curry, and is a nice palate-cleanser after a robust beer. Bulwark Cider can be found on the web, Facebook, and Twitter. Regular contributor and guest reviewer Trevor J. Adams is senior editor with Metro Guide Publishing and the editor of Halifax Magazine. In 2012, he published his first solo book, Long Shots: The Curious Story of the Four Maritime Teams That Played for the Stanley Cup (Nimbus Publishing). 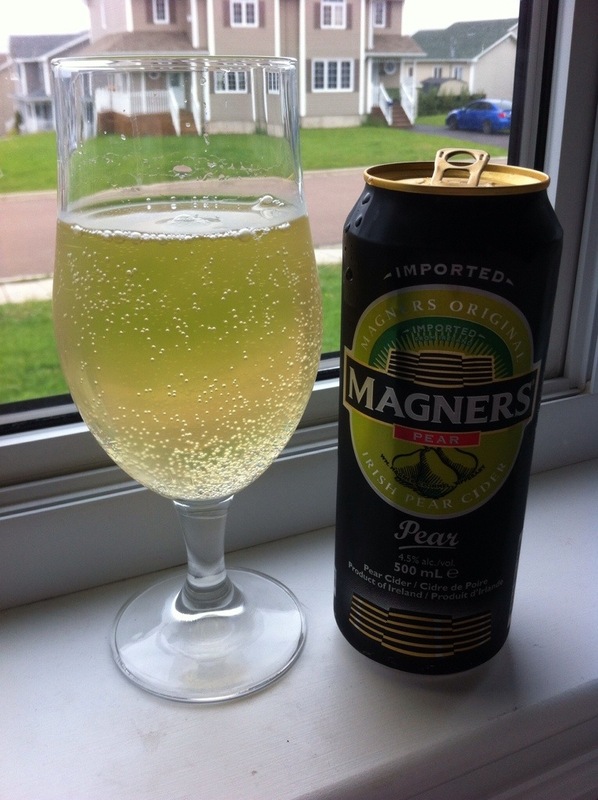 Magners Irish Cider is a producer of ciders, not just from apples, but a variety of fruits, including pears. Magners is owned by C&C Group, owner of several brands of cider and beer. Appearance: Pale yellow in colour, white wine like and very clear. Well carbonated with a bit of head that disappears very quickly. Aroma: The aroma is fairly light with notes of apple, pear, and grape. There is a little funk. Taste: The flavour is somewhat wine-like with a fair bit of the pear flavour coming through. A bit on the sweet side of balanced, carbonation keeps the balance from being too sweet. Fairly light and refreshing. Mouthfeel: Light bodied with a decent amount of carbonation. Overall: Okay, this is not beer, but sometimes its nice to step outside the six-pack box. Perry is a growing trend and because it is refreshing and balanced I can see why. The would be a nice summertime drink for a hot day. On ice, it becomes super smooth and not hard to drink at all. A bit warmer, theres a bit more body and flavour.